Still today we have atmospheric phenomena many people have never heard of, know little about or have at least never seen themselves. 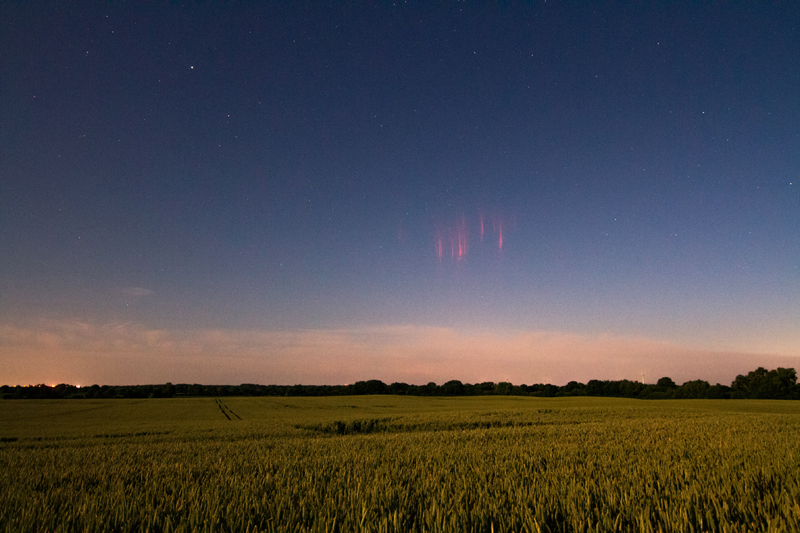 For me one phenomenon I had never seen until recently are the so-called red sprites. Red sprites are a high atmosphere light phenomenon (also “transient luminous event” or TLE) related to thunderstorms and extend over altitudes between 40 and 100km above ground. They can have various forms, sometimes like carrots or tendrils, often reticulate, sometimes rather bushy. It has been shown that positive lightning is at least correlated to the occurrence of red sprites, probably triggering them under certain conditions as sprites mostly occur a few to several milliseconds after CG+ (cloud-to-ground positive) lightning. Negative cloud-to-ground lightning (CG-) can rarely cause sprites, approximately 99% of sprites are related to CG+-flashes. Positive lightning is a tropospheric type of lightning where an electrical discharge from the positively charged anvil (top) of a thunderstorm to the ground takes place whereas much more common negative lightning originates in the lower part of cumulonimbus clouds. A discharge from the top of a thunderstorm to the ground requires an enormous amount of charge (hundreds or thousands of a Coulomb) so they only make out a small percentage (about 5-10%) of all lightning in thunderstorms and have been found to be more likely to occur in longer-lived dissipating thunderstorms and winter storms (maybe because the tropopause is a few kilometers lower during winter, hence less charge is required for a discharge from the top of a thunderstorm to the ground). The conditions above a thunderstorm, in the stratosphere, mesosphere and ionosphere are also important for the formation of sprites. Yet the exact processes in and around thunderstorms that lead to the occurrence of sprites are still not fully understood. What is certain is that most thunderstorms do never cause sprites. From satellite observations a global sprite occurrence rate of approximately 1 per minute has been derived whereas the tropospheric flash rate is about 3000 times higher: 44 per second on average. Most sprites appear over Mesoscale Convective Systems (MCS) with a cloud top area of more than 100.000km² while above super-cells or air-mass convective storms rarely any sprites are observed, though super-cells can trigger other TLE like e.g. blue jets. During the night from July 2nd to 3rd, 2015, I was out in the fields near Felmerholz a few kilometers outside of Kiel, Schleswig-Holstein, actually hoping for some noctilucent clouds. These days they can often be seen here throughout the whole night as the sun never goes below approximately -13° altitude. Fortunately they did not appear which seems rather absurd to say. But instead of focusing on the northern horizon I began to center my attention on the thunderstorms at the convergence line moving from the Netherlands through the North Sea towards Denmark and the extreme northwestern Germany at that time. It is not clear if this system can be characterized as MCS, though its sheer size on satellite images allows of that suggestion reaching from the northerly Netherlands and western Germany to northern Denmark. For me it was visible over the northwestern horizon and steadily producing visible tropospheric lightning about 150-200km away. I decided to try to catch some sprites which I have been trying for years when the conditions seemed good. I was pretty sure it would be impossible to catch them as the moon was shining practically at its fullest and midnight twilight was the other reason I did not really believe in this possibility. Though I had a hope. So to maximize the chances of capturing sprites, which I assumed to be a very faint phenomenon, I thought it would be best to reduce the exposure time and increase aperture and ISO setting to compromise between a short light integration time and image quality. So I started continuously capturing images of the distant thunderstorms at 16mm, 3.2s, f/2.8, ISO3200 on a Canon 7D (APSC) for around two and a half hours. After about 30 minutes I recognized the first, my very first sprite on a picture struggling to believe in what I saw. Not only since there was a sprite visible on the image high above the thunderstorm but I was also puzzled about its brightness and size. I continued to shoot for another two hours, the whole observation period was between 22:25 UT and 0:50 UT. As I continued I found another three sprites on my images. When I later analyzed the raw images on my computer I found three more sprites on the images which were rather small and faint compared to the others seen before. The first (faint) sprite I captured occurred at 22:37 UT, which is just 12 minutes after I started. The next ones were at 23:03 (bright), 23:18 (bright), 23:26 (bright), 23:29 (faint), 23:35 (bright) and 23:39 UT (faint). True midnight, when the sun is lowest, was at 23:23 UT with a sun altitude of a bit above -13°, so it was barely astronomic twilight. Of course there are some gaps between all images (mostly approx. 0.2s, but sometimes several seconds up to a few minutes due to image revision) so that it is absolutely possible that even more sprites actually did occur. I could not see a single one with the naked eye, though I don’t want to say it wouldn’t have been possible. At least the images suggest, it would have been possible to see and my eyes were not too focused on what happened in the sky. Remarkably all sprites appeared over the northern part of the squall line, which was approximately 200km away from me. There’s one other observation of the very sprite at 23:03 UT from central Mecklenburg-Vorpommern, which suggests that even much greater distances from a thunderstorm of several hundred kilometers may allow suitable conditions for observing sprites but also smaller distances of just around 100km might be suitable. After about 0 UT (2 am CEST), when no more sprites appeared over the northern part, I tried to capture some over the more southern part, but within an hour, no more sprites could be captured by the camera though the tropospheric lightning activity remained high. I did not change the camera settings during the whole image recording, so if they had occurred they would likely be visible in the images. Of course it is still possible I missed some due to the camera reaction time. But from my observations, I want to make the educated guess that there must have been a difference between the northern and the southern part of the squall line, which certainly was not the frequency of the visible tropospheric lightning but probably the fact that the northern part was indeed dissipating with a slowly decreasing frequency of discharges. During these two and a half hours I took more than 2000 images to get at least seven sprites. If the sky would have been darker I could have used longer exposures and thus had to take less images but I would say it was definitively worth it. Lang, T. J., W. A. Lyons, S. A. Rutledge, J. D. Meyer, D. R. MacGorman, and S. A. Cummer (2010), Transient luminous events above two mesoscale convective systems: Storm structure and evolution, J. Geophys. Res., 115, A00E22, doi:10.1029/2009JA014500. Victor P. Pasko, Yoav Yair, Cheng-Ling Kuo. (2012) Lightning Related Transient Luminous Events at High Altitude in the Earth’s Atmosphere: Phenomenology, Mechanisms and Effects. Space Science Reviews 168:1-4, 475-516. Posted on July 7, 2015, in observations, self-luminously phenomena and tagged sprites, thunderstorm. Bookmark the permalink. 6 Comments. Very strange. I shall have to do some study on this. Thank you so much for sharing! Phenomena like this have always fascinated me.